There’s nothing like a Nazi who thinks he’s hard. They always end up getting reminded – more often than not the hard way – just how hard they are not. Still, it’s nice to have them around so antifa can get their slap on every now and again. But when those same boneheads find a way to make money from pretending they are hard, that takes things to another level. For some time now, there has been some issues with this crowd getting into the Mixed Martial Arts (MMA) scene. 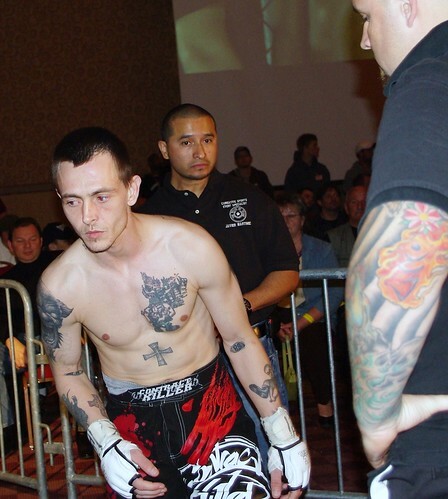 Fighters with neo-Nazi connections like Melvin Costa Maryland “Skinheads” member Doug Sonier or MMA neo-Nazi clothing lines like Hoelzer Reich have prompted some cause for concern, and from time to time when they show their faces they have been getting kicked to the curb. To that end, what do you think is going to happen to a neo-Nazi Mixed Martial Arts organization operating in the Baltimore Area? Chances are if you know anything about the bonehead scene out there you know who is heading up this thing: Jay Tankersley of Maryland “Skinheads” and Doug Sonier’s coach. The guy loves it when we write about him, but we’re not too sure he is going to be all that happy about this. And we even posted this on Christmas, just to make his holiday even more festive! We know that Tankersley is pretty much used to getting kicked out of gyms he tries to hang his hat in, so he shouldn’t be surprised if this latest one feels compelled to do so. Let’s face it, Nazis made it clear that if they had their way the freedoms that we all enjoy would be rendered null and void. It’s pretty laughable when they then turn around and cry about their freedom being violated, when we all exercise ours to keep them away from us, but this is why we call them boneheads. Neo-Nazi Doug Sonier has announced that he is fighting in a few weeks at what is called the AFO (American Fighting Organization) Thanksgiving Massacre. At 0-10-0, we have our guesses as to who is going to be massacred, but it is the principle of the thing. All over the country, people have been trying to clean the Mixed Martial Arts scene of the neo-Nazis trying to gain a foothold in the sport, but they either fly under the radar or the promoters give them a pass. Contact AFO and let them know how you feel.